Successfully Added Car Emergency Signal Kit (Traffic Wand + Flashlight + Roadside Beacon) to your Shopping Cart. This versatile Car Emergency Signal Kit is all you need during a vehicle breakdown or emergency. Use it as a flashlight, hand-held traffic wand, or set it down as an emergency roadside beacon to alert other drivers. Made from a sturdy, durable aluminum and silicon construction, this Car Emergency Signal Kit is ready for years upon years of use. Thanks to the small size, you can just keep it inside the glove compartment and have it ready immediately in case your car suddenly breaks down, adding a bit of calm to a normally chaotic and nerve-wrecking situation. Hand-held traffic wand: The ultimate tool for traffic control at night. This Car Emergency Signal Kit is useful for guiding traffic, signaling of a broken car at night, and of course official police use. Emergency roadside beacon: Just set it down and be worry-free of incoming traffic. 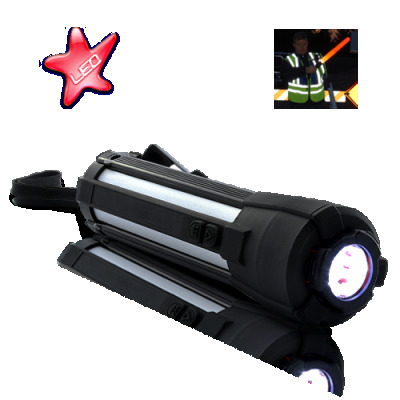 With an ultra bright orange light and 2 modes (Flashing / Illuminating), to make the beacon even more visible. This Car Emergency Signal Kit also comes with a unique extend-able tripod design which allows for 4-step height control, so you can place it on any ground shape or level. Ultra bright LED flashlight: An emergency source of light which will definitely save you some trouble when fiddling in the trunk for your repair tools. This Car Emergency Signal Kit is the next must-have gadget for your car. Order today and we'll ship it out tomorrow. Brought to you at a low, factory-direct price by Chinavasion, the leader in wholesale electronics. Stay calm and stay safe in emergency situations! Can I use this Car Emergency Signal Kit in the rain? Exposure to a small amount is OK, but please do not use during heavy rain.